During last week's keynote at the Worldwide Developers Conference, Apple announced a number of additional features coming to Safari web browser as part of its new macOS High Sierra operating system, due to release in the fall. Apple claims that in its current form Safari is the fastest web browser in macOS when compared with Chrome and Firefox, but it is promising even more speed and better power efficiency in High Sierra. One of the most welcome new features that was announced at WWDC is Autoplay blocking. 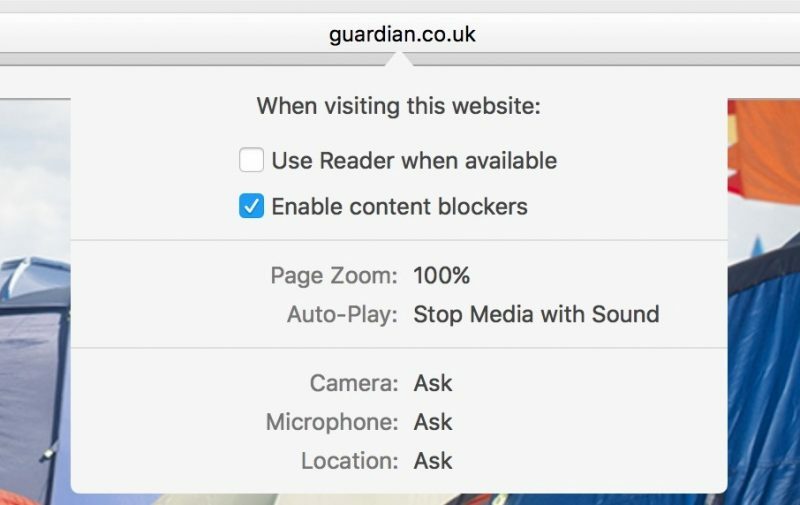 This prevents websites from playing video the moment you visit a page, which should make browsing a lot less infuriating. As of the High Sierra developer beta, the feature is enabled by default for all sites, but can be specified on a per site basis by the user. Another new Safari feature that Apple is introducing is called Intelligent Tracking Prevention. (This appears in iOS 11 under the Safari setting "Try to Prevent Cross-Site Tracking".) Safari was one of the first browsers to include mechanisms that try to prevent cross-site tracking – blocking of third-party cookies is a default Safari behavior – but elaborate API methods have been employed to overtake those efforts in the intervening years. Apple's own testing has found that popular websites can harbor more than 70 cross-site tracking and third-party cookie trackers that all silently collect data on users while making the browsing experience increasingly sluggish. To solve this, Apple's new feature uses local machine learning to identify cookie types and partition them or purge the cross-site scripting data of suspect ad trackers, without affecting the functioning of helpful cookies like those containing localized data or login details, for example. The feature should increase user privacy as well as boost overall browsing speed. 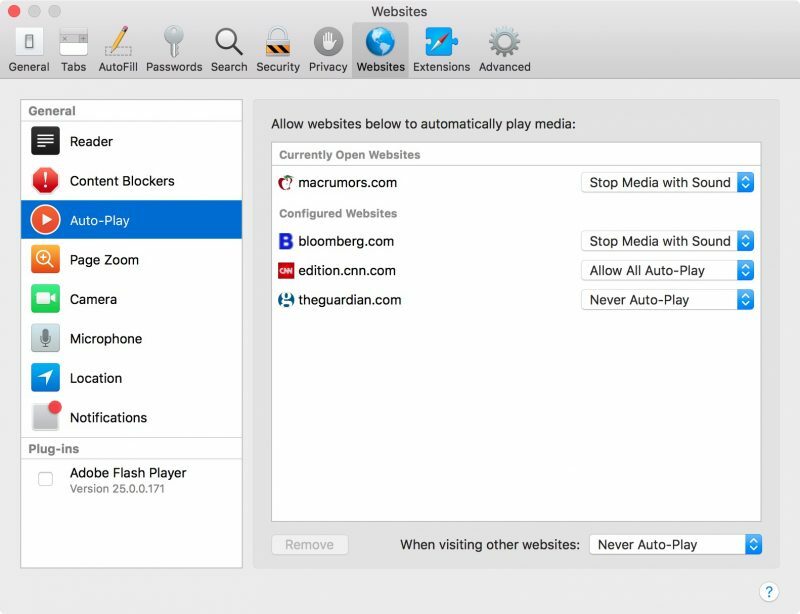 Elsewhere in Safari, users will be able to specify a number of other web page settings on a per-site basis. For example, it will be possible to set a zoom level for a particular web page, as well as enable/disable notifications and content blockers, and set camera/microphone and location service privileges for a site so that they remain active the next time you visit. In addition, Apple has added a new Reader Mode option that lets users automatically enter the stripped down easy-reading mode whenever they visit a website, enabling them to enjoy content without ads, navigation and other distractions as a default setting. The new Safari will be available in the Public Beta of macOS High Sierra, which is expected to drop later this month. Eager users can also get a taste of the new features in the latest release of the Safari Technology Preview. It can NEVER be fast enough, but faster is better. The auto-play feature is great--I hate when I'm reading news and some annoying ad or news video starts babbling and screaming up screen somewhere. This is the feature I've been waiting the most! Apple did a very good job with this interface in Preferences. Everything is there, it is clean, concise, easy to use. Arguably one of the all-time best improvements to Safari. This will continue to be a battle -- the advertisers will not take this sitting down. MarketingLand published "How Apple’s Intelligent Tracking Prevention works & why Google/Facebook could benefit most ('http://marketingland.com/apple-safari-intelligent-ad-tracking-what-we-know-216865')" two days after the keynote. As noted in this WebKit blog article "Intelligent Tracking Prevention ('https://webkit.org/blog/7675/intelligent-tracking-prevention/')", there is a 24-hour window where cookies will be more widely available. The marketeers will exploit this window -- count on it. MarketingLand also notes an article by a blog article by privacy expert Alexander Hanff "Apple Safari's Intelligent Tracking Prevention can not prevent tracking ('http://www.privacy-news.net/news_article/5936b50c178a907559b1e5f3')." Apple's changes will clearly help, but we may need to have legislation to stop certain server-side tracking. I switched from Chrome to Safari about 6 months ago. It took time to adapt, but I'm glad I did it. I also use DuckDuckGo ('https://duckduckgo.com') as my default search engine. Every little bit helps. Follow the links above to see what the industry is saying about it. I'm certain the marketeers have "developer" accounts and have already started poking and prodding the macOS and iOS betas. How did you get Ghostery installed? I checked the site, and it’s very outdated. It’s for Safari 5.4.10, Chrome 7.2.2, and Firefox 7.2.2. On my Mac, I have Safari 10.1.1, Chrome 57.0.2987.133, and Firefox 53.0.3. That's just poor choice of wording on Ghostery's site. They should have worded it as it's version 5.4 of Ghostery for Safari , but they wrote "Ghostery for Safari 5.4. Ditto for Firefox, as it is Version 7.2.2 of Ghostery for Firefox and works with Firefox 48 I believe. If you check their website, they update all the time with Firefox. They are going to correct their wording to avoid confusion. Ghostery works beautifully well and is actually the database that others, I believe Adblock Plus?, use as the most up to date for trackers. Once you use a tracker blocker like Ghostery, you'll never go back as it opens your eyes to how pervasive and intrusive they are. It also will educate you how dangerous Google's efforts are as whether or not you are using a Google product, they are the primary installer of trackers. I guess that's why Google had to drop their corporate motto of "Do No Evil." Remember, if you use Adblock Plus, check your settings and consider not allowing "acceptable ads," as that let's Google and Facebook through. The two biggest abusers of privacy on the planet. For example, if I turn off blocking on MR, you'll see that they are allowing over 20 trackers to be installed! Even though I don't use Google products, Google tries to install these trackers on me on this web site. We need legislation to make everything opt in. Google "does" Evil. We need those features for iOS Safari too! Only the new design layout is missing. But please don't use it on MacRumors. It's against the forum rules even to write about content blocking, at least if MR could be involved. Safari is getting worse and worse with every new version. It can't even play some YouTube videos without stopping the picture and going on with the sound. Some websites look also like a mess. Everything was fine on my almost 6 Year old fasted MacBook Pro I could get until some Safari updates ago. I don't think that's correct. Unless I misunderstood, they were talking about the new version of Safari when they compared its speed with the competition. That is the way I read it too; the new version will be the fastest. I feel like I am one of the few people who actually use and enjoy safari.